Babolat Stars and Stripes Propulse 3 shoe giveaway! You are here: Home / Announcements / Babolat Stars and Stripes Propulse 3 shoe giveaway! This contest is now over, thank you to all that entered. 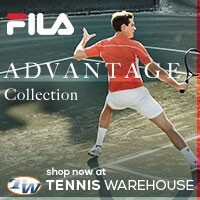 I will do another giveaway for the 2012 US Open in August/September. 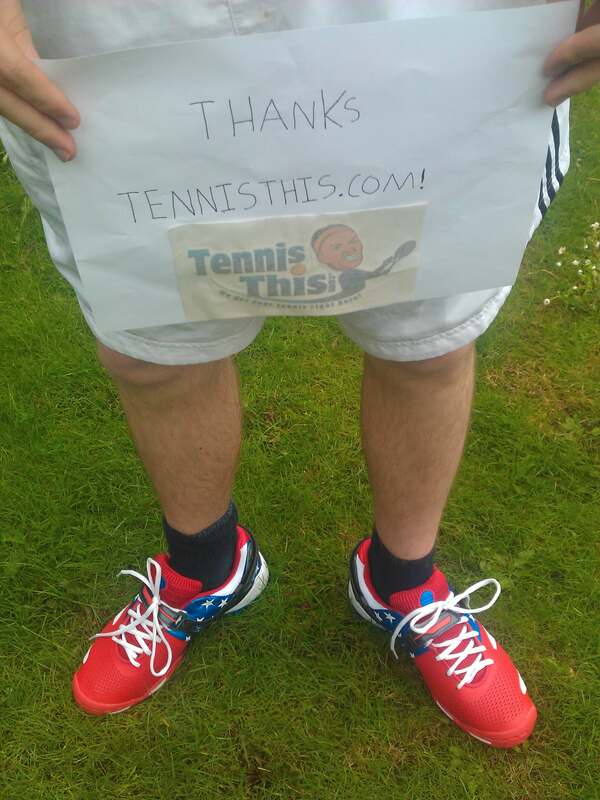 Babolat Stars and Stripes Propulse 3 shoe giveaway winner from the U.K.
Yep, you know how I do it, every major I hold a giveaway where one lucky winner gets some really cool tennis gear! In the past, I have given away tennis strings, tennis racquets, and tennis shoes. Most recently, for the 2012 French Open, one lucky winner recieved a free pair of 2012 Nike Vapor 9 Tour SL’s, the shoe of choice for Roger Federer. Babolat recently released the Stars and Stripes Propulse 3 edition; this is a limited edition tennis shoe! Since 2012 is a very special year, with the 2012 Olympics and the 2012 US Open, I have decided to give away a pair of Babolat Propulse 3 Stars and Stripe edition to one lucky winner! 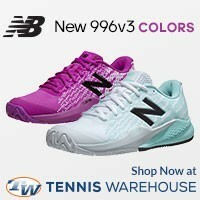 This Propulse 3 Stars and Stripe tennis shoe giveaway ends July 4th, 2012 (fitting right?). All you have to do enter is leave a comment below with your favorite Wimbledon moment. Then tweet the contest (if you have a twitter), and share on Facebook. Pretty simple I would say. On July 5th, 2012, I will select one winner at random, the winner will be contacted directly*. The Propulse 3 is the preferred shoe of American Andy Roddick, which he will be wearing during the 2012 Olympics. The Propulse 3 is a favorite among many high level players, the shoe offers support, stability, traction, and durability that many tennis players seek. The Propulse shoes are very comfortable and feel great on the foot. *Only 1 winner will be selected for this Babolat Stars and stripes propulse 3 shoe giveaway. The winner will be selected at random, when the winner is selected, I [Tennisthis.com] will send an email to the winner (please be sure to use a valid email address), the winner will have 24 hours to respond. 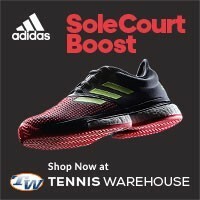 After the winner has been confirmed, I will take care of everything, I will personally order the shoes from Tennis-Warehouse and ship them to you. If an international winner is selected, that winner agrees to pay for international shipping. 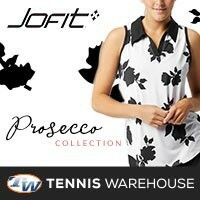 Babolat and Tennis-Warehouse do not endorse this giveaway in anyway. Final 2002 between Nalbandian and Hewitt. The only argentinian on reaching the finals agains a player ranked number one like Leiton on Grass. Rafael Nadal defeats Roger Federer, 2008 Final: When the almost five-hour battle was complete, John McEnroe declared it was the best match he had ever seen — of course, McEnroe took part in a few epic matches during his day — and thanked Federer for his spectacular effort. The match consisted of all the elements needed to make it a classic — two best tennis player of an era, one of whom may be the best of all time, and poor weather and delays that made a closely-fought match even more nerve-racking. After losing the first two sets, Federer played like a champion, rallying to force a fifth set. But Nadal, who had yet to win a Wimbledon title, refused to wilt under pressure. Despite losing two match points in the fourth-set tiebreaker, he regrouped to face only one break point in the fifth, ultimately unseating the five-time defending champion. John Isner vs Nicolas Mahut on 2010 when they played the longest match in the history of tennis. It’s my favorite moment, not only because of the physical and mental endurance both players showed, but because at the end of a 3-day match, it was an American who won. GO USA!!!!! Roger Federer vs Pete Sampras 2001 this was the passing of the Crown from Pete on Grass. Most Emotional I have ever seen Roger! My favorite Wimbledon moment was the match where John Isner played in 2011 which was the longest match ever lasting 11 hours 5 minutes over three days with scores being: 6-4, 6-3, 6-7 (7-9), 7-6, 70-68 for 168 games. The last set lasted 8 hour 11 minutes with each player serving over 100 aces with John Isner serving 113 aces. and Mahur servining 103 aces. The endurance of these two tennis players was amazing. My favorite moment was when Andy Roddick beat Andy Murray in the semifinals to make his latest wimbledon final. He almost had Federer in the final! Favorite Wimbledon moment would most definitely have to be last year (2011) when Djokovic whooped Nadal!!! What made it so sweet is the fact that I was there to witness the victory!!! When that last shot come off of Nadal’s racket before it even crossed the net I knew it was out and that it was all over!!! I felt as if I was the only Djokovic fan there cheering when he won! Mostly Nadal fans but I didn’t care! I let em have it…lol! So proud of my boy that day! Also got to tour and play on the grass courts! Wow!!! That was an experience! Very different from hard and clay courts! No idea what kind of bounce is coming! It was supposed to say Goran !@#$%&*? Autocorrect!!!!!!! My favorite Wimbledon moment was Agassi winning over Glean for his first GS win. The BorgWhen he wasn’t attacking the umpires with all the charm of a pointy pitbull, John McEnroe was pretty tasty with his racket, as the classic 1980 final against Bjorn Borg showed. The fourth set’s tie-breaker was so protracted it felt like Peter Jackson was directing, but despite Mac’s win in the 16-18 tie-break he lost the final set. We are entirely serious, John. Entirely serious. How about Ashes victory over conners? Tim Henman hits a ball girl and then apologizes with flowers and a kiss. My Favorite moment at wimbledon was the fourth set tie-break between Federer and Nadal in 2008 where Federer saved a championship point with the best back-hand passing shot I’ve ever seen and then went to win the set! I too had a few of them. I would say the Henman v Ivanisevic semi-final. The match lasted over three days. Henman was the better player in the 1st day , and led 2-1 in sets before rain ended play. He was the better player on the second day but lost the fourth on a tie break, before rain. Ivanisevic won the decider on day three. This is one of the great examples of rain changing a match, as Henman had won the 3rd 6-0, before rain interrupted. The best moment of Wimbledon was ….. Hmm I had a few of them. How about Roger Federer beat Pete Sampras for the 1st time, in 5 set.